Within the ancient Mediterranean world, Egypt stands out for the exceptional wealth of its textual sources. This richness tends to obscure the fact that most parts of the country provide no written sources. Papyri survive only in a dry environment, thus in very specific areas. In the damp Nile delta, which encompasses over 50 % of the ancient settlement and agricultural land, papyri did not endure, with the exception of small amounts of carbonized examples. Historical reconstructions of these regions therefore rely mainly on archaeological research. 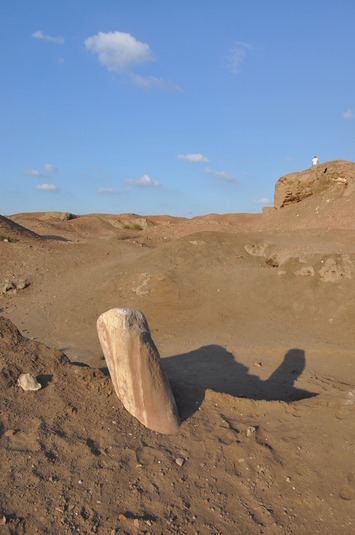 This research project, launched by Stephan J. Seidlmayer and Robert Schiestl under the auspices of the German Archaeological Institute Cairo and in collaboration with the Egyptian Antiquities Authority, investigates the northern part of the western central delta. The initial project was made possible by funding of the Fritz Thyssen Foundation and support from the German Archaeological Institute Cairo. The northern edge of the area lies about 30 km south of the Mediterranean coast and 15 km south of the southern edge of the Burullus lagoon. The low lying northern fringes of the delta have hardly been visited by archaeologists, let alone been scientifically studied. Only in the last 20 years has this been starting to change. This survey is the first systematic study of this region. 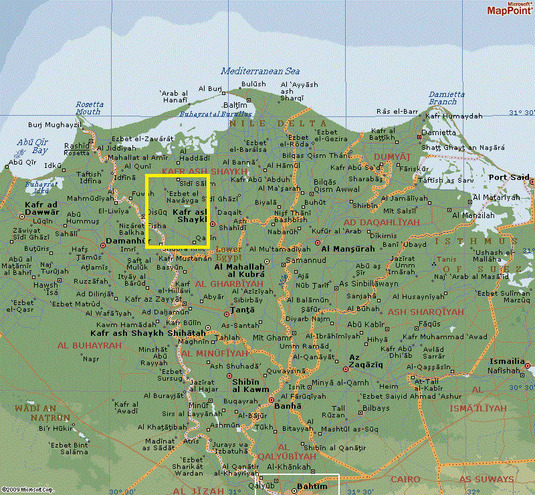 1: Map of the Nile delta. The survey region is marked by the yellow rectangle. The modern Nile delta is an intensely used agricultural zone, with fields or settlements covering every square meter of the land. The further north one moves in this part of the delta, the amount of remaining ancient settlement mounds (called tells or koms), many of them quite large, increases. In modern times a marginal region, it is becoming clear that this part of Egypt flourished in the Roman and Late Roman periods (1st c BC – 7th c AD). The earlier settlement history of this region is, however, far from clear. An important urban center was founded at Buto (Tell el-Faracin, 31 11 43 N/30 44 32 E) in the 4th millennium BC (Fig. 2). 2: The ancient city of Buto (Tell el-Faracin). A Roman column juts out from the settlement mound. Photo: Robert Schiestl. This city is being studied as a long term archaeological project by the German Archaeological Institute Cairo. It has a long yet disrupted settlement history: The settlement seems to have been abandoned for almost 1500 years, between the end of the Old Kingdom (c. 2200 BC) and the Third Intermediate Period (c. 800 BC). Following its reoccupation, the city flourished until the Late Roman Period (7th c AD). The reason for the initial abandonment was most likely environmental. Parts of the city were flooded, either due to a shifting branch of the Nile or due to unusually high Nile floods. This was the starting point for asking the main research questions of the survey: What is the settlement history of the region around this city? 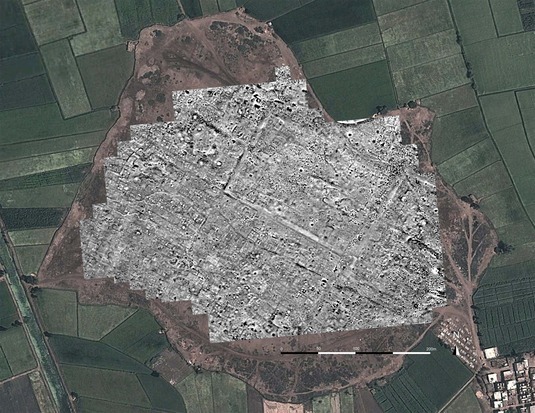 Is the settlement history of the central site reflected in the regional settlement patterns? In the dynamic environment of the delta, with Nile branches moving, old ones silting up and new ones forming, the development of settlements can only be understood by reconstructing the ancient landscape. This branch of investigation is being conducted in collaboration with geographers from the Goethe Univ. of Frankfurt am Main, Jürgen Wunderlich and Andreas Ginau (Department of Physical Geography). 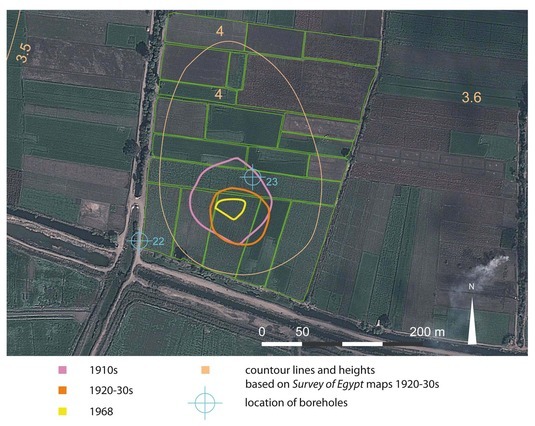 The field survey, conducted since 2010, documented many archaeological sites for the first time and identified numerous previously unknown ones. The preservation of the sites ranges from free standings and non overbuilt mounds (Fig. 3) to entirely levelled sites (Fig. 4). The latter category could be located precisely with the help of historic maps and satellite imagery. Auger core drillings are undertaken to investigate existing settlement layers and the natural underground on which these settlements were founded (Fig. 5). In the delta the choice of place for founding settlements is of crucial importance, as due to the location in an alluvial plain settlements had to be built on elevated ground above the flood line. Many settlements are overbuilt by modern villages and cemeteries (Fig. 6) and can thus only be investigated by auger coring. Those ancient settlement mounds which are not overbuilt can be studied more intensely. 3: The ancient settlement mound of Kom el-Gir. The tell rises a maximum of 7.5 m above the surrounding fields. The surface is dotted with pottery, predominantly of Roman and Late Roman age. Photo: Robert Schiestl. 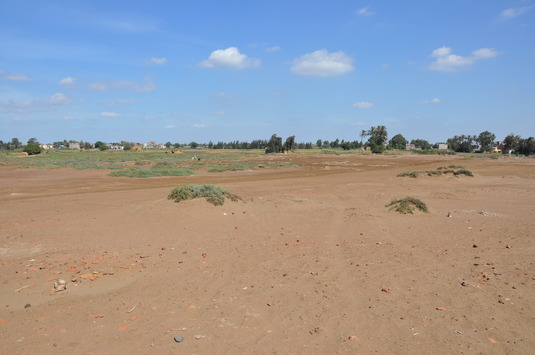 4: The site of Kom el-Roka has been entirely levelled and transformed into fields. Based on historic maps and satellite images it could be located and auger core drillings verified a very thin layer with settlement material beneath the surface. Illustration: Robert Schiestl. 5 Left: Auger core drilling in fields northeast of Buto with a hand auger. Photo: Robert Schiestl. 6 Right: Auger core drilling on edge of modern cemetery of Nashart, southeast of Buto. The cemetery was built on a Roman and Late Roman settlement mound. Photo: Robert Schiestl. 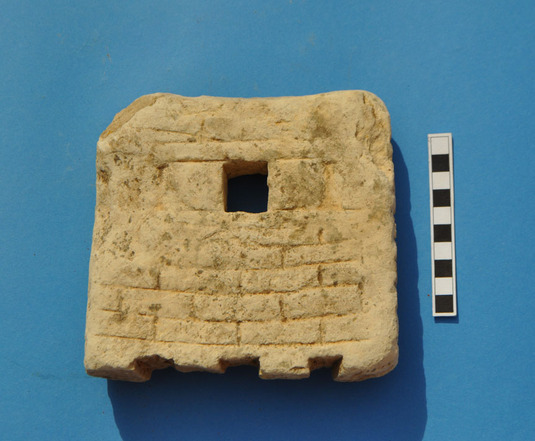 Magnetic prospection was used at the site of Kom el-Gir, northeast of Buto (Fig. 7). The results show an orthogonal layout of a town, dominated by two large structures (Fig. 8). A large rectangular enclosure is most likely a temple compound of the Ptolemaic or Roman period. Adjacent in the south is a Late Roman fort built of mud brick and measuring about 150 x 90 m in the interior. Square towers jut out at the corners and further towers are built along the sides. 7: Magnetic prospection at the site of Kom el-Gir. Photo: Robert Schiestl. 8: Results of the magnetic prospection at Kom el-Gir overlaid over a google earth satellite image. 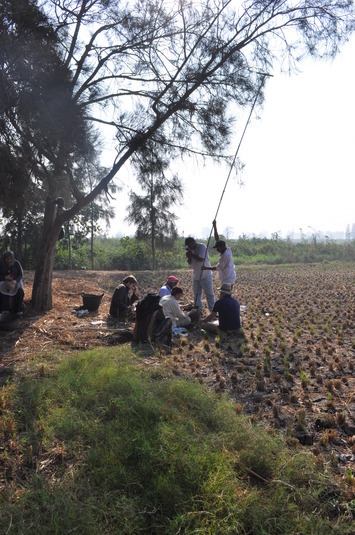 About 13 ha have been investigated by magnetometry to date. Illustration: Robert Schiestl. The dating of the sites is based on pottery finds, both from the surface (Fig. 9-11) or from the auger cores. 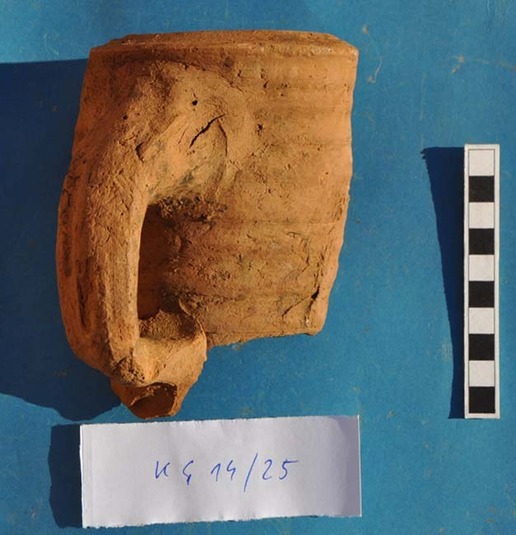 Examples of pottery are a Roman amphora made of Nile clay (Fig. 9), an imported Roman mortar (Fig. 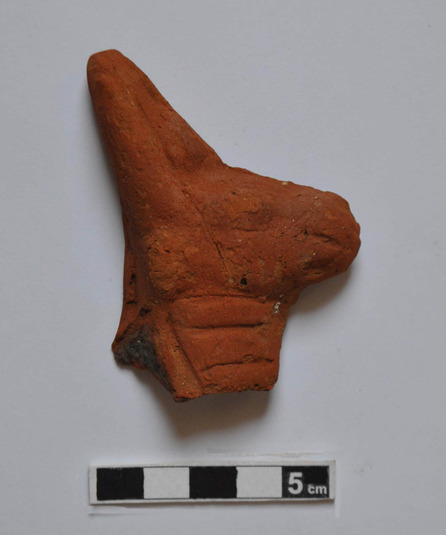 10) and a Roman terracotta votive of an Apis bull (Fig. 11). 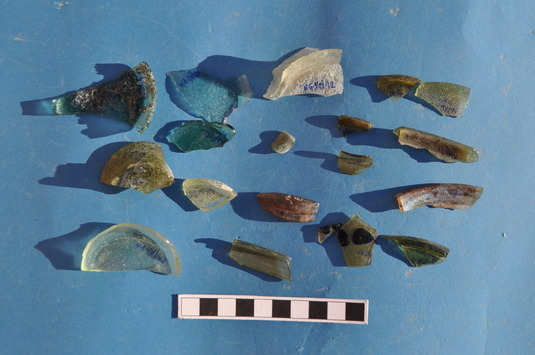 Other finds from the surface at Kom el-Gir include numerous fragments of Roman and Late Roman glass, currently investigated by Daniela Rosenow (British Museum London, Fig. 12). 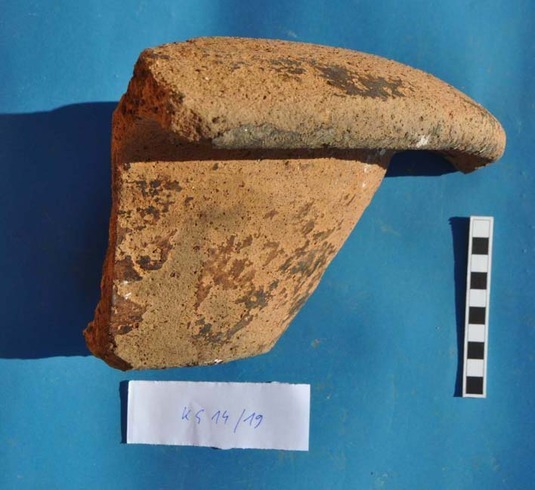 10 Right: Roman mortar, imported to Egypt, Kom el-Gir. Photo: Robert Schiestl. 11 Left: Roman terracotta of an Apis bull, with a sun disc between his horns. Photo: Robert Schiestl. 12 Right: Fragments of Roman and Late Roman glass, Kom el-Gir. Photo: Robert Schiestl. Fig. 13 shows a fragment of a limestone model of a house of Ptolemaic and Roman date. It is the top floor of a tower house, a slender multistoried building, which was common in Egypt since the Late Period (7th c BC). Based on the layouts of houses found in the magnetic images, numerous such town houses were built in the ancient settlement of Kom el-Gir. A linear distribution of settlements east of Buto suggests the location of an ancient watercourse. This is currently being investigated by auger coring, using a vibracoring device. (Fig. 14). 13: Upper part of a limestone model of a house, Kom el-Gir, Ptolemaic or Roman. Photo: Robert Schiestl. 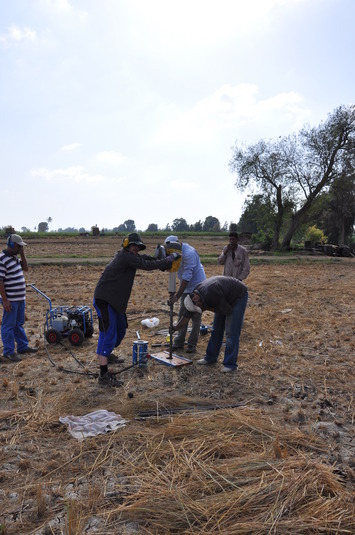 14: Auger core drilling east of Kom el-Gir in order to verify an ancient submerged branch of the Nile. For further information you can visit the webpage of the German Archaeological Institute. 1) Reconstruction of the ancient landscape. 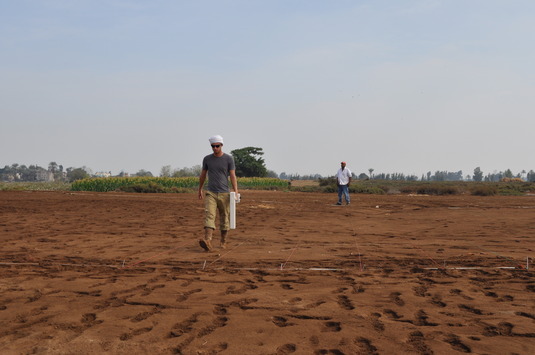 Methods will be mainly auger core drilling and electric resistivity measurements in order to detect the course of an ancient branch of the Nile submerged under alluvial deposits. Collaborators are Jürgen Wunderlich and Andreas Ginau (Department of Physical Geography, Goethe Univ. Frankfurt am Main). 2) Creation of a Digital Elevation Model for the western central Delta. This will form the basis for a reconstruction of the regional ancient watercourses in their entire length, with an emphasis on the Thermuthiac branch of the Nile. This branch, first described in Ptolemy’s Geography in the 2nd c AD, had silted up by Medieval times and has to date not been located. Based on Ptolemy’s account it is known that the branch ran east of Buto and Kabasa, most likely to be identified with Shabas esh-Shuhada, and west of Sakha (Xois), just south of modern Kafr esh-Shaikh. A preliminary Digital Elevation Model has been able to locate the precise course of this branch southwest of Sakha. 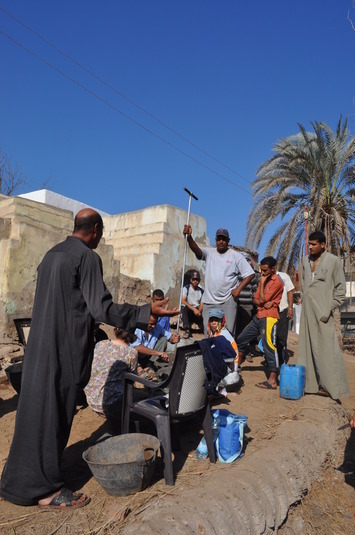 3) Initiation of small scale archaeological excavations at the site of the site Kom el-Gir in order to verify the results of the magnetic prospection.